Umm, I try to force it to the english site, and it still insists on redirecting to de.aliexpress.com. I did get on long enough to order some 22mm drivers for my F13s. Will have to see if they “stick”. Umm, I try to force it to the english site, and it still insists on redirecting to . Please start a thread documenting how you accomplish this. It’d help to know what glue is being used. I’m getting restless waiting for it to arrive. Shipping says it’s waiting to be accepted by usps so it’s probably crossing the ocean. I’m excited. I’ve seen a rare light that the mcpcb was glued in so good it was easier for me to mount the head in the lathe and turn out the emitter and mcpcb rather than spend a lot of time trying to break it free with heat or whatever. I’ve even cut through complete drivers that way as well. Any idea what’s a good battery for this light?. AT Viking Pro E21A Quadtrix 6500k 9080, AT Wizard Pro E21A Quadtrix 6500k 9080, Jetusolis 6500k 9080, JetE21A 4000k 9080, JetE21A ‘Red’ HCRI Led, CRX Jaxman Z1 Flat White!. Any idea what’s a good battery for this light?. Runtime more than anything. Thanks!. Sanyo NCR18650GA 3500mAh i would say . There is a word or two to describe someone who would do something like the “chipped lens” issue also. And those words are a whole lot worse than “Low Down Dirty Dog”. .
Any idea what’s a good battery for this light?. Runtime more than anything. Panny-B (Panasonic NCR18650B, 3400mAH) or Sanny-A (Sanyo NCR18650GA, 3500mAH) would be my choices. This makes no sense. Modders are not the problem. People who like to take advantage of others and game the system are. I see may folks make claims for refunds that many a "modder" would just fix without making a fuss. That doesn't make people who don't mod, people that should be protected against. Anyway, I won't buy the light if it is glued. Especially, if the glue is somehow supposed to protect against my type. This makes no sense. Modders are not the problem. People who like to take advantage of others and game the system are. I see may folks make claims for refunds that many a “modder” would just fix without making a fuss. That doesn’t make people who don’t mod, people that should be protected against. Anyway, I won’t buy the light if it is glued. Especially, if the glue is somehow supposed to protect against my type. I didn’t see the word “Modder” used anywhere in what ‘T18’ wrote. If Jaxman want’s to glue his lights that is his choice. If you don’t buy them, that is yours. There are a Whole Lot more people that Are NOT modders than are. Jaxman is one of the most conscientous and honest company that there is. They check and recheck meticulously every light sold. I must agree that if they wish to glue than so be it. If you don’t like then wait for a host. Jaxman is one of the most conscientous and honest company that there is. They check and recheck meticulously every light sold. I must agree that if they wish to glue than so be it. If you don't like then wait for a host. It is Jaxman's conscientiousness that gives me hope that they may listen to folks like me and not glue their lights shut. LED technology marches at a fast pace. I imagine an exciting emitter will eventually come along that I will really want to have in this light. Instead of a host, I would like to have the light the way they intended it to be for a time. So instead of wait, I chose to express my desire to Jaxman. A company that seems to value input. It is Jaxman’s conscientiousness that gives me hope that they may listen to folks like me and not glue their lights shut. LED technology marches at a fast pace. I imagine an exciting emitter will eventually come along that I will really want to have in this light. Instead of a host, I would like to have the light the way they intended it to be for a time. So instead of wait, I chose to express my desire to Jaxman. A company that seems to value input. Pretty sure it was said that they used a glue between the mcpcb and emitter shelf, the light itself isn’t glued together. This doesn’t stop one from changing out an emitter when the next latest and greatest comes along, it may make it a bit more challenging but then, that’s what it’s all about isn’t it? Right here….if you really want to get into a head…consult db not even nitecore can stop him. I can certainly appreciate that also ‘ImA4Wheelr’. That is a completely different approach than you stated in post #165. More like asking/ suggesting…. with legitimate reasons, rather than “demanding”. "Paul had told me he was going to start gluing his lights after someone started screwing with him over a Z1 sold fully assembled then buyer claiming the lens was chipped and wanted Paul to give him a new lens, the most expensive part of the light, Paul was so seriously ticked off about a guy who buys a Z1 then disassembles the light and then claims it came messed up, that’s when Paul told me he would start gluing all lights now." Not sure how you protect the lens by gluing down the MCPCB. Sounded like the bezel and maybe more was going to get glued. If red thread lock is used, you need to get to around 400F to melt it. Look back at the beginning of the thread, in the original post, the last image is a picture of it. Thick white goop on the back of the MCPCB is pictured and identified in the text. glues, conformal coatings, o-rings, gaskets, and potting compounds, all materials that are frequently used in the construction of LED based luminaires or lamps and often contain volatile organic compounds (VOCs) may have a negative impact on performance, reliability and lifetime. Edward Steinke, application engineer at Cree, explains the set of problems . . . .
. . . The basic structure of the LED’s lens and encapsulants is a silicone polymer, which is a stable chemical compound. Any VOCs present in a SSL system can diffuse into the gas permeable silicone lens and encapsulants of the LED. Within the molecular structure of these silicone materials, the VOCs will occupy a free space in the interwoven silicone polymer. With subsequent exposure to high photon energy emitted from the LED, along with the heat from the lighting system and the environment, the volatile compounds trapped in the LED’s lens or encapsulants can discolor. This discoloration of the trapped VOCs can degrade the light emitted from the LED. This discoloration tends to occur in blue, royal blue and white light producing LEDs that use blue wavelength LED chips with yellow phosphors for spectrum conversion. 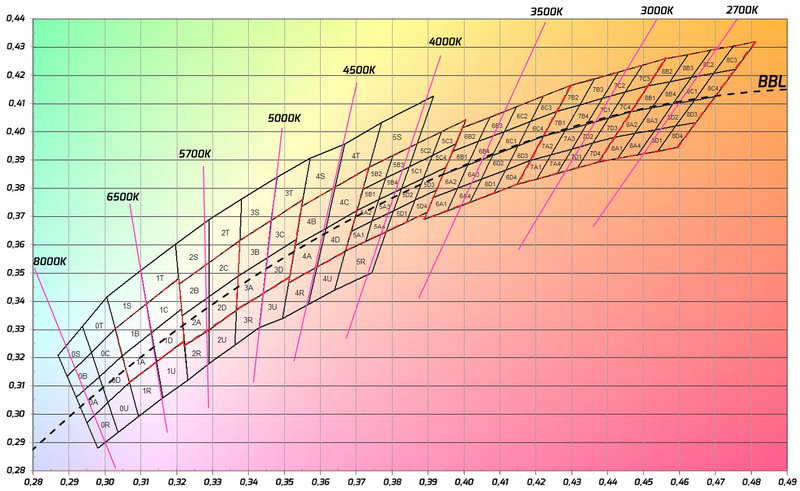 This sensitivity to VOC is not unique to one LED manufacturer but is a known problem for all types of blue, royal blue and white light LEDs. Chemically induced discoloration is less prevalent and not as noticeable with amber, red or green LEDs since these color LEDs have longer wavelengths, therefore a lower frequency, and produce lower photonic energy compared to blue LEDs. . . . I think that’s why a variety of LED sealants are out there for sale, which could be of use after de-doming I think. But hey, this is all second-guessing before the flashlight I bought arrives. Time will tell. No, that was DB Customs who said that, but i disagree. 4wheeler’s point that it’s dishonest people that are the problem is a valid point though. Something like a warranty seal would be good, i suppose glue can have that role, but it’s nasty when a light can not be disassembled because then it can’t be repaired either, or modded. So for modders a host would be great. I do hope that it is only the LED board that is glued; I have a FET driver from MTN waiting to be used. As a side note, I wonder if the famous black metal Convoy clips will work. The grooves seem much more shallow in the Jaxman. It would not protect the lens. To protect the lens from “meatheads” the bezel would have to be glued. Legitimate “modders” would just have to deal with it or buy a host…… IF avaiable. I am not a fan of glue. BUT….. 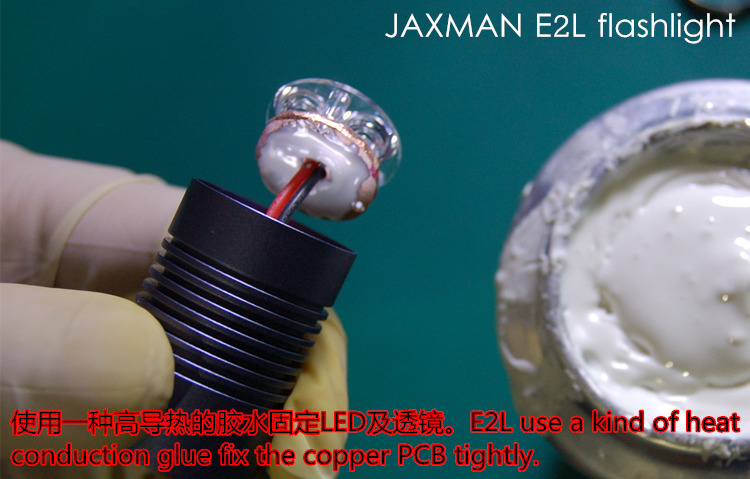 IF Jaxman feels he must glue the entire light together, so as to make it “tamper proof” for warranty purposes; so be it! It is his company & his choice….. simple as that. “We” don’t have to like it, but it is not up to us. I don’t like all the sensors & emission crap on new automobiles this day & time….. but I am gonna have no luck at all calling or emailing Ford or GM and telling them I want mine without all that “crap”. Or telling Nitecore or another major light maker not to glue their lights together…. I imagine they would get a good laugh as they deleted the email. Thankfully Simon of Convoy does not glue his completely together, and he does offer hosts as well. BUT again, it is his business and both of those are his choices. For us to gripe and whine about how Jaxman chooses to run his business is ridiculous. He is not here to cater to BLF, CPF, or modders in general. He is trying to make a bit of money, I imagine; so he & his can survive in this world. As far as I am concerned it is not up to us to “TELL” him how to do that. Nothing wrong at all with asking or making suggestions as far as I am concerned…. maybe he will consider them and possibly even implement some of them. Maybe he won’t. But, “to me”; statements such as…. ‘if it is glued no sale’ or threats of not buying his lights if they are glued are just unnessary. Why even say it, who cares if you buy it or not? Most people who buy lights will never even think about taking them apart in any way, form, or fashion. I do hope there will emerge a way to easily purchase Jaxman hosts. But if that does not happen I am not going to have a cornary. I can’t imagine he would use the “bad” stuff. I’m betting he has done his ‘homework’ as meticulous as his lights are done. That is a great link too, thanks for sharing it. I have the two lights en-route from Jaxman, it’ll probably be a while as they seem to be taking their sweet time getting on the plane to the US, but of course that is out of Jaxman’s hands. I still say it’s the modders that cause the reason. Nobody else breaks open the light in the first place, as far as I can tell… most regular users are afraid to kill it. I used to also be afraid I’d ruin something, but eventually I learned that whatever I might ruin could be replaced so it became ritual to disassemble them all, regardless of glue or price. I think, to date, of the 400+ lights I’ve been into the only one I killed was the little angle light I got for review. The junction bolt that held the angle head on and allowed the wires to pass through was very difficult to reach, I tore it up getting it apart and it’s just stayed torn up, never bothered to try and repair it. Have you all looked at his M2? I can’t find any info on a Jaxman M2. Have you got a link or some info T18? Edit: Sorry misread your question, sort of not with it right now..